The three outstanding Tennents Irish Cup quarter-finals have all been rescheduled for Tuesday, March 13. Coleraine will face Glentoran while Championship side side Larne go to Ballymena United. In the Belfast derby, Linfield will face Cliftonville. Every effort was made to have the National Stadium at Windsor Park playable with overhead heating systems brought in on Saturday morning. While the pitch was given the all clear, there were concerns about stadium access and snow in the stands. 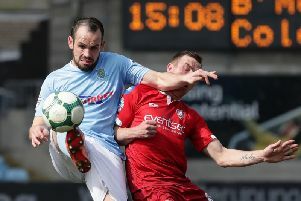 The NI Football League later announced the Ballymena United v Ballinamallard United Premiership fixture planned for Tuesday, March 13 has been postponed because of the Cup tie now taking precedence. Championship side Loughgall are awaiting the draw for the semi-final after the other ties are completed having defeated Glenavon 2-1 in the only game which went ahead on Saturday. Glenavon supporters and officials worked tirelessly to get the game the green light.